In addition to thoughts of me stuffing my face with s’mores muffins, the other part of my brain was seriously confused as to how the Food Network could let something called a S’mores Muffin into their magazine without toasted marshmallow. 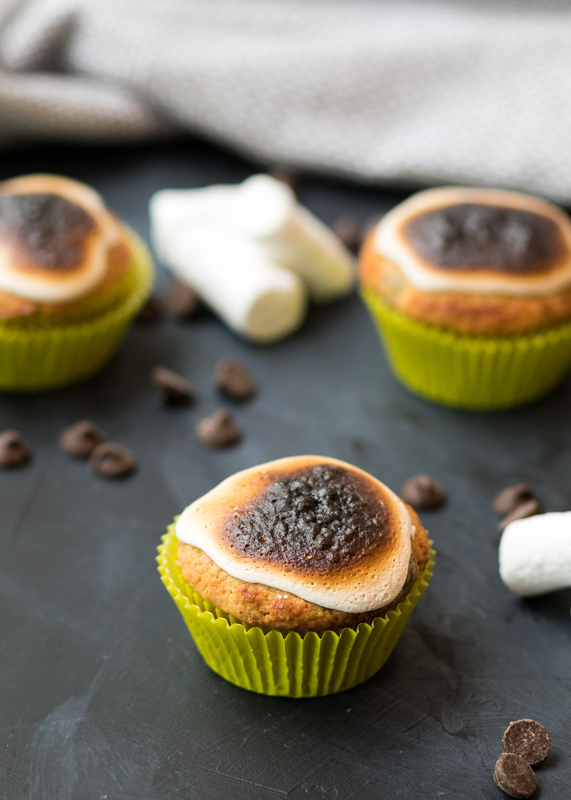 I would understand if the marshmallow was a middle layer or inside the muffin, but a layer of marshmallow right on top sitting completely un-toasted? Unacceptable! 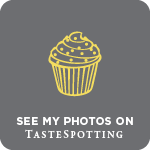 If you’re confused because I’m going on and on about un-toasted marshmallow while the photos on your screen clearly have crispy gooey marshmallow I will let you know that I rectified this horrific oversight. I know I said I wasn’t going to change these Food Network muffin recipes so I could properly review them (other than my food allergy last month), but I couldn’t not toast this marshmallow. Too much was on the line- I’ve been thinking about these muffins since January! 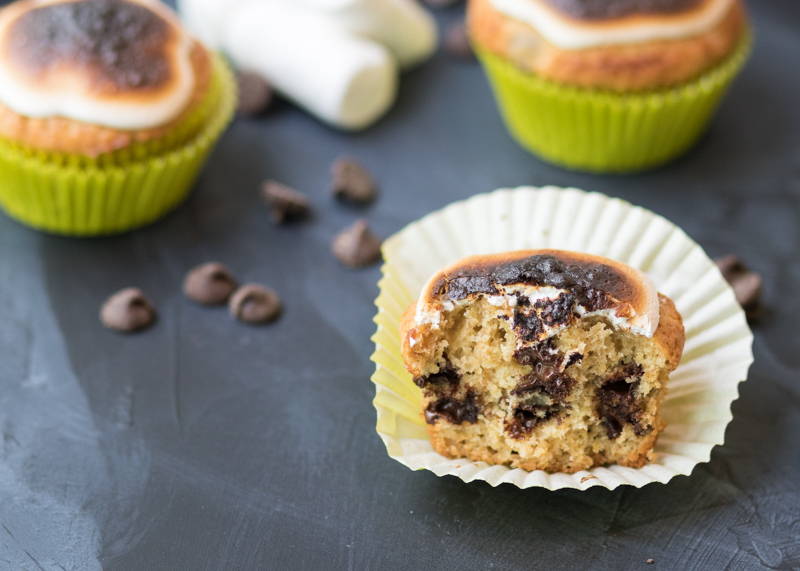 These S’mores Muffins did not disappoint. In fact, they exceeded my expectations of deliciousness. I love how they swapped some of the flour for graham cracker crumbs to give the muffin base a hint of that spiced cookie taste. I did use semisweet chocolate chips instead of milk chocolate chips because that’s what I keep in our house, but I’m kicking myself because they would have tasted even more authentically s’mores if I had stuck with the milk chocolate. 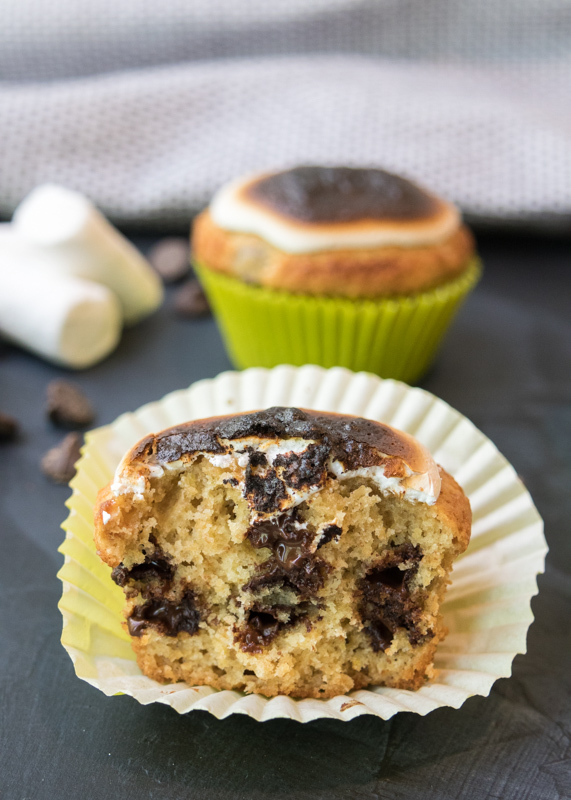 The melted chocolate and roasted marshmallow fluff probably pull these into the dessert category, but I’m going to stick with they are called muffins so I’m allowed to eat them for breakfast. 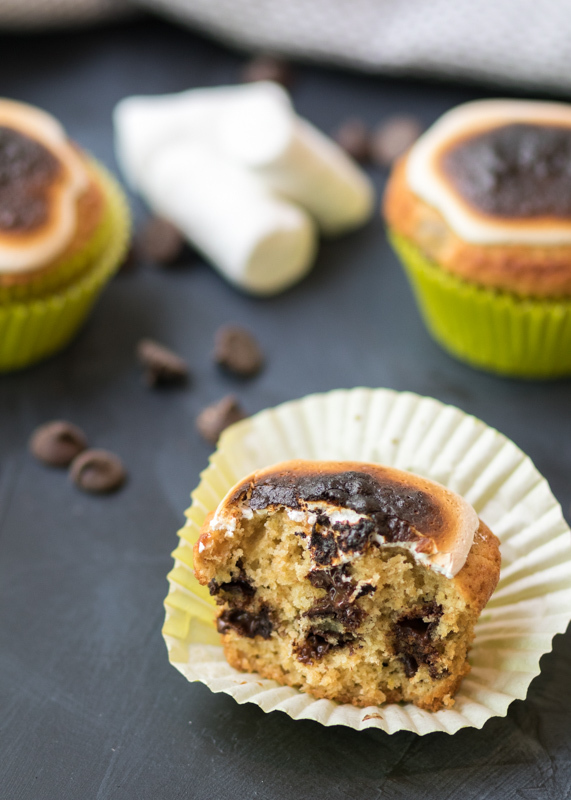 No judgement allowed, just a quiet breakfast table except for the occasional “mmmm” because everyone is busy indulging in these crave-worthy S’mores Muffins. Preheat the oven to 350 degrees F. Line a 12-cup muffin pan with paper liners and set aside. In a small bowl, combine the chocolate chips with 2 teaspoons of the flour and set aside. In a large bowl, combine the flour, graham cracker crumbs, baking powder and salt. In a separate medium bowl, whisk together the melted butter, sugar, milk, vanilla and eggs until smooth. Pour into the flour mixture and stir until just combined. Add the chocolate chip mixture and stir. Divide the muffin batter among the lined cups. They should fill the liners ¾ full. Lightly tap the bottom of the pan on a hard surface so the top of the batter smooths out slightly. Bake the muffins for 20-25 minutes, or until a toothpick inserted in the center comes out clean and the tops are lightly browned. Cool the muffins for 5 minutes in the pan then remove to a wire cooling rack. 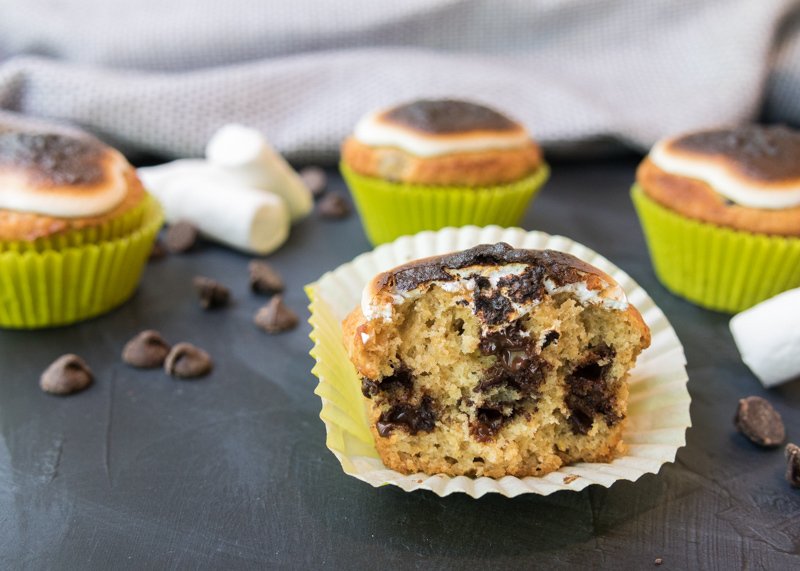 Once completely cool, top each muffin with a tablespoon of the marshmallow cream. 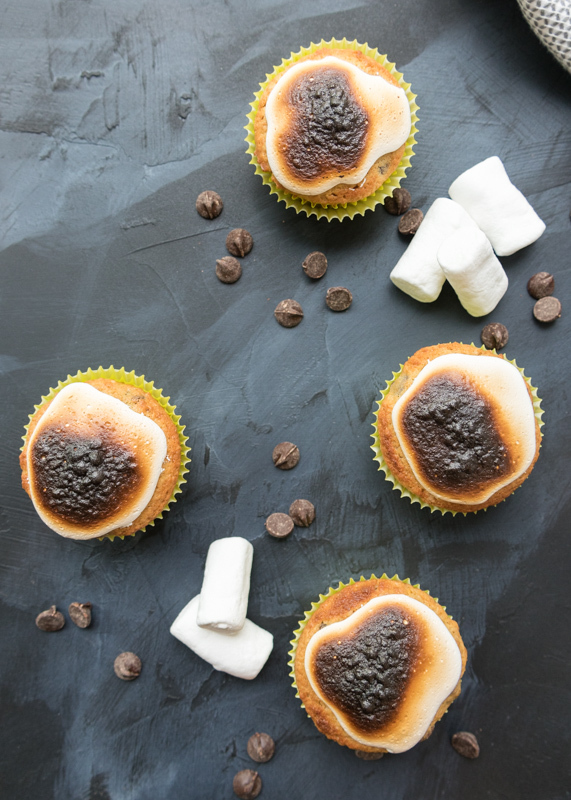 To toast your marshmallow cream, use a kitchen torch or place them under a broiler for 5-10 minutes, making sure to watch them carefully. Recipe from January/February 2018 issue of Food Network Magazine .